Curiosity Mars Rover 1 year later & how NASA made me cry. It has been over a year since the Curiosity Mars Rover successfully landed. The team at NASA really did something amazing here. Not that you need me to point that out to you... I was lucky enough to meet Jeff Norris after his speech during PAX 2012 in Seattle. Or, as I like to call it: "The so inspiring it could make robots cry" speech. Jeff works for NASA and supervises operations systems teams that make a variety of space missions possible. Here are some pictures from that day, the speech and related links. Chris and Jeff. 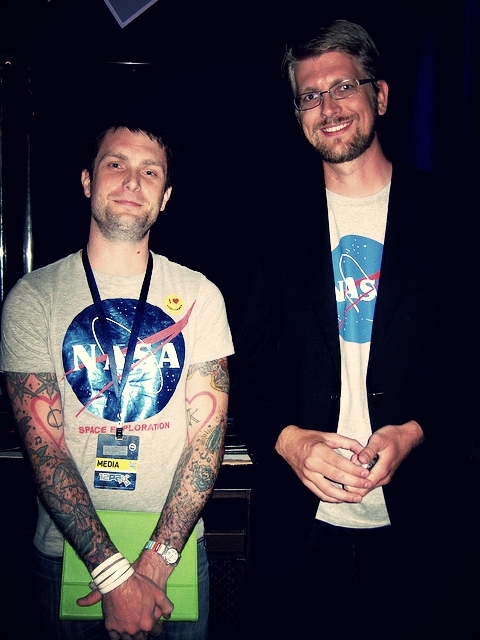 Guess which one of us programs Space missions, and which one of us 'just has the shirt'.